Hi, my name is Emily Grochowski and I will be the VP of Programming for UPB this coming year. The summer is coming to a close, and you’ve now had the chance to meet most of the new executive board for UPB and taken a peak into their lives this summer. The other day I was watching America’s Next Top Model (because let’s be real, it is ALWAYS on) and the girls did a photo shoot where they had to define the four sides of themselves. Since it’s about time I write a blog post, I’m going to follow Tyra Banks and let you know a little about myself by illustrating the four sides of me this summer. As an International Business and Spanish major, I traveled to Spain for a summer abroad program. Besides being able to travel to Madrid, Barcelona, Andalucia, and Portugal, I got to experience a lot of Spanish culture in Salamanca where I attended the Universidad de Salamanca and lived with a Spanish-speaking family. One of my favorite memories was experiencing the world cup in Spain. Thousands of people would gather in the local courtyards and cheer on “La Furia Roja” on the big screen. I have a marketing internship with a large dive company, which gave me the opportunity to fly out to California for a week-long dive trip. 4 days and 10 different dives off the coast left me exhausted, but also gave me an Open Diver Certification and a lot of sun. Ok this isn’t really what it sounds like, and it’s actually a bit of a stretch, but it’s the best I could think of. All of my other adventures throughout the summer required me to have some means of income; therefore, I worked at Gold’s Gym where I’ve worked since 2005. When I say I spent “long hours at the gym” I don’t mean pumping iron, more like scanning membership cards, but you get the point. I am a very avid reader, but during the school year I really don’t have the time or energy to pick up a book. The summer gives me a perfect opportunity to indulge. At this time, I‘ve already read 23 books! Next stop on my summer is back to Harrisonburg for 1787 Orientation, where I’ll have a chance to welcome the next generation of Dukes! 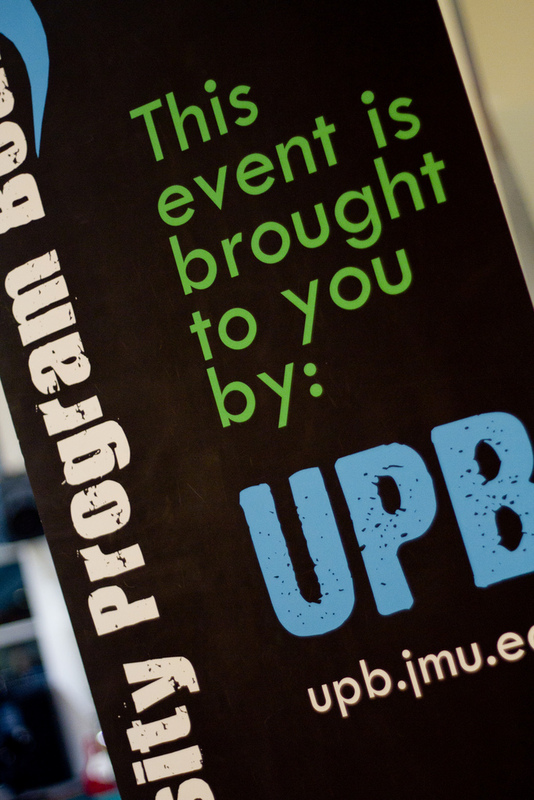 Hello my name is Emily Grochowski, and I am the Executive Assistant for UPB. Anyone who knows me personally can confirm, I may be one of the most inartistic people around. I am extremely inept at anything that requires drawing, painting, sculpting, or cutting in a straight line. Even my handwriting looks like an awkward, 4th grade boy’s. With this kind of introduction to myself, it may be hard to believe that back in the day I was a regular Michelangelo. These are the chronicles of a middle-school art prodigy. First period art class at Rachel Carson Middle School had never seen such expression as when you handed me a pack of pastels. Landscapes, portraits, pottery, collages, I could do it all. Throughout the course we were instructed to illustrate highly complex subjects, including a shoe, a vase of flowers, and my personal favorite, an artistic display of leaves. When the annual art show rolled around, several pieces of my highly diverse collection were showcased. The night of the show, tensions were high as the judges circled the cafeteria analyzing each individual work. After much deliberation, the awards were distributed. I won two blue ribbons for my tribal vase and Monet-inspired watercolor painting, and was recipient of the greatest honor, “7th grade artist of the year.” I’m not sure I have ever been so proud. I wish that I could tell you that I went on to accomplish great things in the artistic world, inspiring new movements and reaching new heights…but I didn’t. Unfortunately, that was the end of my short-lived art career. Pretty much a week after the art show, I lost any skills that I ever possessed. Is it possible that I never actually had talent? Most likely the case. However one thing I do know, every since that fateful day I struggle to draw a stick figure. Today, the University Program Board will be a hosting You Made It! Night at a local paint-your-own pottery venue downtown. I encourage all of you to come showcase your own artistic whims and enjoy the extended hours and student discounts that You Made It! has to offer JMU. Although my creation may hold a strong similarity to the teapot I painted for my mom in first grade, you bet I’ll be downtown tonight. There’s even a bus shuttle available that will be running between the Godwin bus stop and You Made It! Hope to see you there.